Eighty years ago today, Elvis Presley was born in Tupelo, Mississippi. He would, of course, grow up to become a cultural phenomenon. Elvis performed in Little Rock throughout his career. In April 1972, he played at Barton Coliseum (with tickets on the arena floor going for a whopping $10!). In the 1950s, he played three at Robinson Auditorium. His first appearance was as his career was just starting to take off. The final, a mere 15 months later, was when he had become a national icon. His first appearance at Robinson was on February 20, 1955. Billed as the “WSM Grand Ole Opry” show, Elvis Presley was third on the bill behind the Duke of Paducah and Mother Maybelle and the Carter Sisters as he began week long tour of Arkansas and Louisiana. On this date there were a pair of shows, at 3:00 and 8:15 p.m., at Robinson Auditorium. Tickets were 75-cents in advance, $1.00 at the box office and 50-cents for kids. It is believed that Gladys and Vernon Presley attended this performance, invited by Elvis who wanted to introduce them to the Colonel. Gladys was a big fan of the Duke of Paducah. 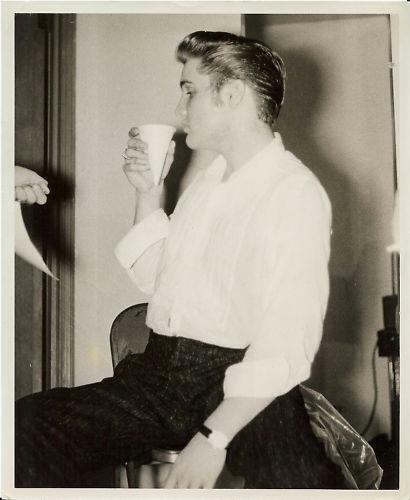 Elvis Presley, Scotty Moore, and Bill Black receive $350 for these two shows instead of their usual $200 per day. In August 1955, he returned and played Robinson as part of the All-Star Jamboree. His third and final appearance at Robinson Auditorium was on May 16, 1956. This time, the Auditorium was packed. The tickets were $1.50 in advance at Walgreens and $2.00 at the box office. The ads featured 8 great acts in “his” variety show which consisted of the Jordonaires; Rick and Emil Flaim and their orchestra; vocalists Frankie Conners and Jackie Little and comedian-magician Phil Maraquin. A second show was added to accommodate the ticket demand. This entry was posted in History, Music and tagged Barton Coliseum, Elvis Presley, Robinson Center Performance Hall, Wayne Cranford by Scott. Bookmark the permalink.